Chicago, IL - On Friday, February 25, 2011, His Holiness Serbian Patriarch Irinej accompanied by Bishop George of Canada and Longin of Nova Gracanica-Midwestern America and its official follower protodeacon professor Dr. Stanimir Spasovic, visited St. Sava academy, parish house at Cathedral church of St. Ressurection of Christ in Chicago. On this occasion His Holiness was informed about the program of teaching and the school work. The St. Sava Academy is a primary school where lectures are bilingual. His Holiness was very satisfied with the knowledge of Serbian of pupils of this school. In a short program, the school principal Mr. Marko Bojovic, teachers and pupils wished Serbian Patriarch welcome and expressed gratitude in archipastoral blessing. In the afternoon His Holiness met with the Diocesan Council of the Metropolitanate of Libertville-Chicago in order to resolve current issues of the administration. His Holiness was informed with the general situation in the parish, so he awarded councilors the archipastoral blessing for the continuation of the work for the benefit of the Cathedral Church and the Holy Church. 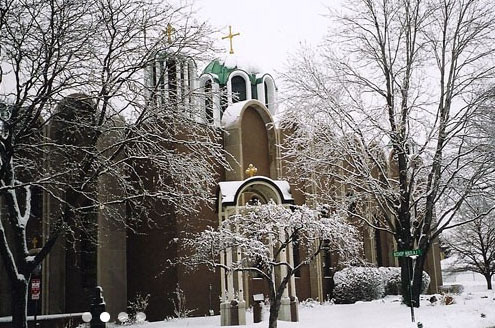 His Holiness on Sunday, on February 27 will serve the Holy Hierarchal Liturgy in the Cathedral church of Ressurection of the Christ in Chicago. The formal banquet in his honor will be later.